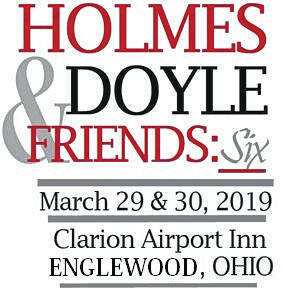 ENGLEWOOD — The Agra Treasurers, Dayton’s only Sherlock Holmes society, will hold the sixth annual conference of Holmes, Doyle, & Friends on Friday and Saturday, March 29 and 30, at the Clarion Inn, 10 Rockridge Rd., Englewood. This conference, drawing Sherlock Holmes and Victorian fans from several states, features a day of talks about Arthur Conan Doyle, Sherlock Holmes and Doyle’s other writings, and various aspects of Victorian Britain. Vendors sell books, magazines and other items associated with Holmes or Victorian Britain and the Agra Treasurers will raffle door prizes of baskets of English tea, English tobacco or other Holmesian items. A welcome reception at 6:30 p.m. on Friday will start the event, with a banquet on Saturday evening at Company 7 BBQ, 1001 S. Main St., Englewood, ending it.